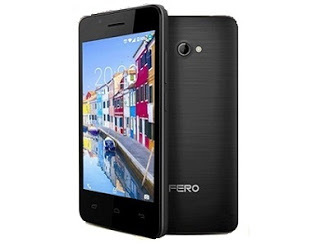 Fero A4001 is a low end and budget smartphone. It's powered by Spreadtrum SC7731 1.3 GHz, Quad-core 1.2 GHz Cortex-A53, has a 4 inches screen display, 8GB inbuilt memory + 521 MB RAM, and it runs on Android 6.0 Marshmallow. See the full specifications below. Fero A4001 specifications. Fero A4001 released date. Fero A4001 price in Nigeria and Ghana.